Sultanhani Stele, originally uploaded by voyageAnatolia.blogspot.com. 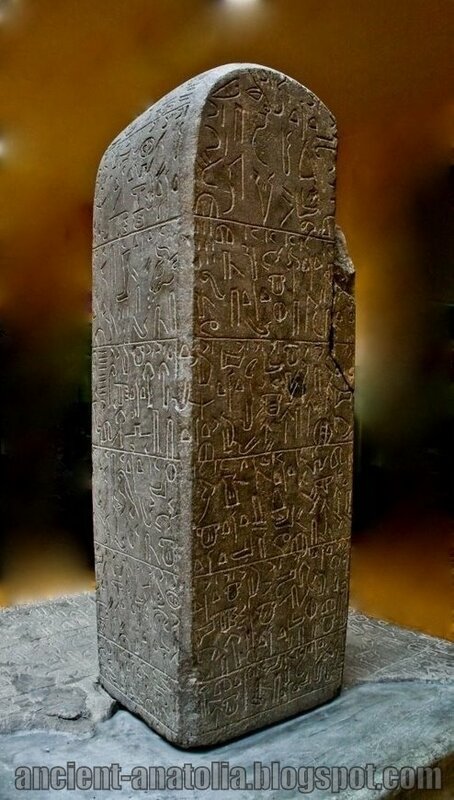 Hittite monument with hieroglyphic inscription. The importance of this stele comes from the inscription written in Luwian language but Hittite hieroglyphs, instead of cuneiform script. It is easier to talk about Luwian Language as a lingua franca. But it is hard to talk about Luwian people. However since there was a Luwian Language, there must be Luwians too. It was found in Sultanhani 50 km. far from Kayseri. It is composed of two parts: a base and a stele unearthed during two separate occasions. The base known as "Sultanhani I Insciption" was found during the construction of Kayseri Sivas railway in 1928. The so called "Sultanhani Stele" was later found in 1939 in a villager's field. The monument was erected by vasal, ruler of town, Wassume in the name of god Tarhui for a better crop from vineyards and orchards, as a gift for the god. At the end of the inscription, there is a damnation section concerned with those who will harm or destroy the monument. Kizzuwatna (or Kizzuwadna) is the name of an ancient Anatolian kingdom in the second millennium BC. It was situated in the highlands of southeastern Anatolia, near the Gulf of Iskenderun in modern-day Turkey. It encircled the Taurus Mountains and the Ceyhan river. The center of the kingdom was the city of Kummanni, situated in the highlands. In a later era, the same region was known as Cilicia. The population of Kizzuwatna was made up of both Luwian and Hurrian peoples. The Luwian language was part of the Indo-European language group, with close ties to the Hittite language. Hurrian culture had a strong influence on the people of Kizzuwatna. Although Kizzuwadna later became a vassal of the Hittite Empire, both the Luwian and Hurrian cultures were to have a profound influence on the Hittites as well. The kings of Kizzuwatna of the second millennium BC had frequent contact with the Hittites to the north. The earliest Hittite records seem to refer to Kizzuwatna and Arzawa (Western Anatolia) collectively as Luwia. Arzawa was the name of a region or kingdom in Western Anatolia, which later to be known as Lydia (Assyrian Luddu, Greek Λυδία) in the post-Hittite era. It was the western neighbour and sometimes vassal of the Hittites, and probably bordered on the Assuwa league to the north. Its capital was Apasa (or Abasa), according to Hittite sources, which may correspond to the later Lydian capital, Ephesus. The language spoken in Arzawa during the Bronze Age and early Iron Age was Luwian, a member of the Anatolian branch of the Indo-European family. In the oldest texts, eg. the Hittite Code, the area of Arzawa, together with Kizzuwatna, was named Luwia. Luwian (sometimes spelled Luvian) is an extinct language of the Anatolian branch of the Indo-European language family. Luwian is closely related to Hittite, and was among the languages spoken by population groups in Arzawa, to the west or southwest of the core Hittite area. In the oldest texts, eg. the Hittite Code, the Luwian-speaking areas including Arzawa and Kizzuwatna were called Luwia. In the post-Hittite era, the region of Arzawa came to be known as Lydia (Assyrian Luddu, Greek Λυδία). Luwian is either the direct ancestor of Lycian, or a close relative of the ancestor of Lycian. Luwian is also one of the likely candidates for the language spoken by the Trojans, alongside a possible Tyrrhenian language related to Lemnian. Luwian has been preserved in two forms, named after the writing systems used to represent them: Cuneiform Luwian, and Hieroglyphic Luwian. In western Anatolia, many toponyms with the "-ss-" infix derive from the adjectival suffix also seen in cuneiform Luwian and some Palaic; the classic example is Bronze Age Tarhuntassa (loosely, "City of the Storm God Tarhunta"), and later Parnassus may be related to the Hittite word parna- or "house". Palaic is an extinct Indo-European language, attested in cuneiform tablets in Bronze Age Hattusa. Its name in Hittite is palaumnili, or "of the people of Pala"; Pala was probably to the northwest of the Hittite core area, so in the northwest of present mainland Turkey. The Palaumnili-speakers worshipped a sky god Tiyaz (Luwian). The Kaska, probably originating from the eastern shore of the Propontis (Marmara Sea), may have displaced the speakers of the Palaic language from their home in Pala. Anadolu’nun Hitit-öncesi tarihi henüz tam olarak aydınlatılamamış olmakla birlikte, 20.yy.’daki arkeolojik bulgular, Anadolu’ya yapılan Yunan göçünden çok daha önce, bu topraklarda Anadolu’nun yerlileri sayılabilecek Luvi ulusunun yaşadığını ortaya koymuştur. Hititler’in çivi yazılı belgelerinde bu halktan Luvili (Luwi'li) olarak söz edilmektedir. Hitit imparatorluğunun yıkılmasından sonra Hititler’in çivi yazısının unutulmuş olmasına karşın, Luvi dili ve yazısı biraz değişikliğe uğramakla birlikte Anadolu’da varlığını sürdürmüştür. Bilge Umar’ın “Türkiye’deki Tarihsel Adlar” adlı ünlü yapıtında belirttiği gibi, Yunan göçünden önce Anadolu ve Ege'de yaşayan Pelasg halkından kalan tarihsel adların Luvi dili temeline dayandığı ortaya çıkmıştır.